In the world of quantum mechanics, the act of observing a phenomenon has a direct effect on the phenomenon (in greatly simplified terms) and is known as the Observer Effect. It’s like the question, if a tree falls in the middle of a forest with nobody around, does it make a sound? This is not a new idea. Bishop George Berkeley (1685 - 1753) was a philosopher, who argued that the world as perceived by the observer is a construct of the observer. Normally, the Observer Effect is taken as being a one-way process: the Observed event changes as a result of Observation. However, the Observer (or instrument) also changes state when the Observed event changes state. 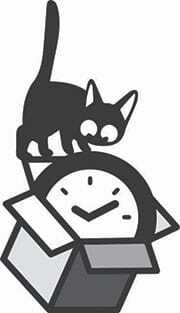 This is not always highlighted but it is a subtlety that Schrödinger’s Clock® illustrates. In the App, when the Observer is detected watching the Clock, the Clock shows that the Observer’s state has changed. If you watch your image shown by the iPhone, you (the Observer) will notice small changes as a result of being Observed yourself. In Forensic Science, the Observer Effect has a parallel in Locard's Exchange Principle: the perpetrator of a crime will bring something into the crime scene and leave with something from it, and that both can be used as forensic evidence.